Prepping ahead goes a long way toward helping you stay on budget and curbing the need for take out under the notion of “I don’t have any thing easy to cook at home.” It’s helpful to always keep a couple of quick cook options stocked in the freezer whether leftovers from a large batch of beans or meat sauce, or pre chopped veggies and seasoning that can be added to your protein of choice. Seasonal vegetables like squash, zucchini and potato can last for several months in the freezer and make an easy breakfast, lunch or dinner meal in a pinch. I’ve added sausage and have also smothered it with onion and garlic to go with chicken. It can also be seasoned a variety of ways to keep things interesting. A quart size bag makes 2 to 3 servings and a gallon would make roughly 6-8 servings. It’s best to chop and freeze it in your preferred quantity. 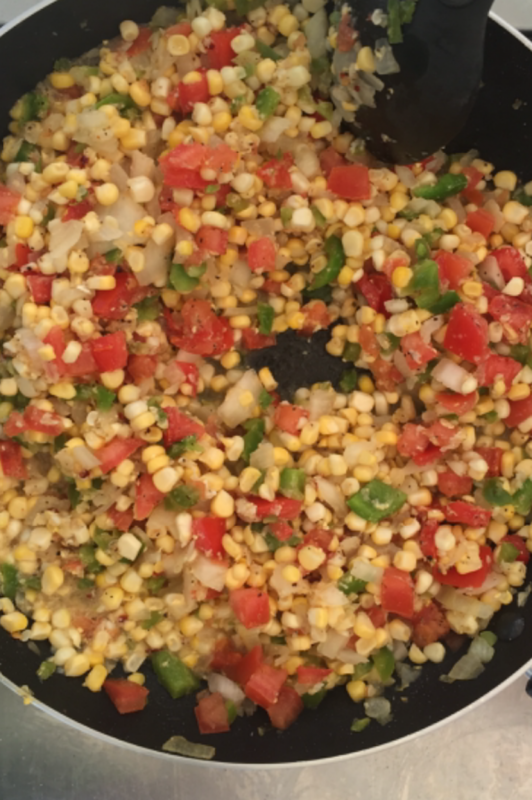 You can always add bell pepper and/or onion (green, white or yellow) to your mix for added flavor. Personally I prefer a higher ratio of the squash and zucchini to the potato for a higher fiber, lower card ratio. After thoroughly rinsing the veggies, I chopped roughly a cup to 1 1/4 of squash and zucchini and a 1/2 cup of potato. when adding the onion and bell pepper, add only a cup of the first two veggies to make sure the quart size bag has space. As some of you may have seen last week, I am attempting to add a videos to support these post. That will be a work in progress :). Please share your thoughts and happy prepping! I’ve been exploring gluten free dishes and pastas to better support friends and family with gluten sensitivities. Simple is best and adding great flavor is what makes it great. Pasta is a simple dish that can be dressed up many different ways and for this dish I went Greek with a dash of North African flavor. I was also excited to use some produce from my own backyard. I have been growing sweet peppers, tomatoes and of course fresh herbs such as rosemary and green onion. This was easy to pair with baked chicken that I seasoned two ways (lemon rosemary and garlic and herb) for some variation this week. Check out the recipe below and be sure to share your thoughts. Bring 4 quarts of water to a boil. Rinse vegetables and herbs. Slice tomato; cut peppers in half and remove seeds before slicing thinly. Chop rosemary. Boil pasta for 8-9 minutes. Chop whole olives or used canned, by straining liquid. Once boiled, add to a bowl, then add remaining ingredients.